Gold Prices - Gold Prices - Gold: The HUI does not want to play! 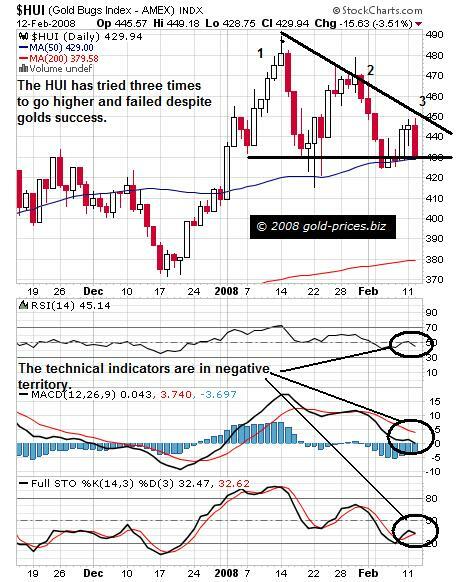 Gold: The HUI does not want to play! Gold has been holding up really well of late despite the myriad on incalculable variables that surround it. However the stocks appear to be sending us a slightly different message. 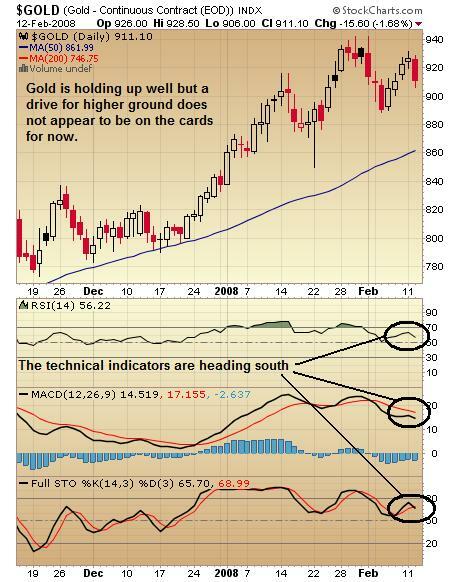 Take a quick look at the chart for gold and you can that the technical indicators are heading south although thus far gold is showing considerable strength. Now look at the chart below for the HUI and we can see that the HUI has tried three times to go higher and failed despite golds success and the technical indicators are in negative territory. As we see it the HUI is telling that it does not want to go higher and is anticipating a lower gold in the near term. This is a very hard call to make as the variables are numerous, such as the lack of buying interest in India, the possibility of more central bank sales, the drop in production in South Africa and the effect of the mickey mouse paper chase that haunts the financial sector. However we all have to make decisions and we decided to reduce our exposure in gold stocks recently as regular readers of The Gold Prices Newsletter will be aware. Was it the right move you wonder, well we wont know for a few more weeks yet. But do beware of a pull back they do tend to come hard and fast, as we have seen in gold as well as silver in the past. If we were wrong we will just have to wait until a suitable entry point presents itself. These are our thoughts for today, if you have an opinion that you would like to voice then add your comments to this post. If you are new to this web site and would like to receive our FREE newsletter regarding investment in gold stocks then please click this link and enter your email address to subscribe. Has anyone noticed the slanted head-and-shoulders top forming on the gold chart? If gold closes much below $900, we could see $850 gold in the next few weeks. Or not, but it's something to keep in mind. Update on earlier comment: I'll probably be in the "or not" camp for about 2 more weeks. As a new subscriber and new in commodities investing, at this juncture, what are your thoughts respective to people holding gold and silver ETFs? Thanks! Its not an easy call to make as these are tricky times, but it does make the blood flow a little faster! To me it looks like we are just taking a pause. Volume is slowing down a bit and we're re-tracing our steps up and down similar to the action back in November to December. I don't see any significant downside pressure yet that would indicate a drop to $850 within the next month. I think we can still move up through mid-April, and I anticipate another push up or two before the summer. There are also a number of other political factors stirring around the world that may cause people to push up gold as well. Gary C - one thing to note about gold and silver ETFs - if you are planning on holding long-term the capital gains are taxed as collectibles (if you are in USA, because IRS considers it the same as buying actual gold bullion). This means you are taxed at 28% rather than 15% if you hold over a year. That's why I personally prefer to stick with mining companies over ETF's. The article on the HUI is useful--it tends to echo Adam Hamilton's very developed analyses appearing on Kitco.com and lemetropolecafe.com . However, I recommend that we all look at Mr. Saville's recent essay on Kitco.com. He demonstrates the limitation of projecting PM stock performance on the HUI alone, and takes into account a number of non-HUI PM companies. His conclusions and hypotheses are well worth a read. It remains ghastly that my PM portfolio is down at least 30 % since April 3, 2007, despite the fact that Au prices have climbed magnificently during this time--especially relative to the U.S. dollar, admittedly, but also relative to a lot of other currencies. The POG rise has been greater than the rise of exploration and mining costs. So... it's all mysterious, and heart-breaking for a lot of investors, big and especially small. It just does not seem to make sense, and so seems unfair. Thanks for the Gold Letter essay on the HUI, though. Just confirms a lot of discouraging news! Breton B.
I agree with JGR in that I think stocks will be heading up before they head down, although I think that we'll see $850 or lower by the summer (as I'll be buying). The $HUI isn't telling me much, since its formation isn't particularly bullish, although the trendline since August is still in force. However, the $XAU (which tracks the larger stocks, I believe) is showing what looks to me like a symmetrical triangle, and it looks like breakout time is near (probably within a few days). I just hope it doesn't break to the downside. This morning I bought some PAAS stock as a short term trade. It also looks close to completing a symmetrical triangle, which I hope will break to the upside. With the broad market rallying, I don't expect downside breakouts anytime soon. In response to Neil Bishop ( in hopes of instilling a little something positive). Down 30% is a sad reality. I looked up many gold stocks that I trade and see that maybe your hope is in the theory that the large stocks with good earnings run first(NOW), and more speculatives and juniors run last. It happened to me in the 2003 run. for ex: KGC is up about 50% from april 2007..GG is up about 30% , AEM almost 100%, randgold(GOLD) is up 100%. so I assume maybe you are in Juniors, which do tend to run they last. In fact, I trade larger ones first, and juniors last, and then GET OUT...juniors run well ,and they can double!! !...but signals the end and a correction. so maybe CDE ,azk, ozn, and others will run soon? I own a few and hope so too. best wishes.